The Road: Begins at NC 5 in Pinehurst, and ends at US 1 Southern Pines, all of which is in Moore County. Towns and Attractions: Pinehurst, Southern Pines. History: NC 2 was born in 1934, running from US 220 (now US 220 ALT) Candor east to US 1 (now unnumbered May St). From Candor to West End NC 2 replaced US 311/NC 70; Pinehurst NC 2 replaced US 311/NC 70-75, while from Pinehurst to Southern Pines NC 2 replaced NC 702. In Pinehurst it followed Palmetto St straight to today's NC 5 with no zig-zag (now part of golf course), then used NC 5 northwest to current NC 211. About 1940, NC 2 west was truncated to US 15-501 in Pinehurst (jct of Midland and Page). 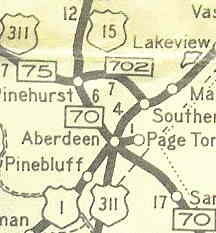 The route from Candor to Pinehurst became an extended NC 211, with US 15-501 remaining on what had been a multiplex east of Pinehurst. 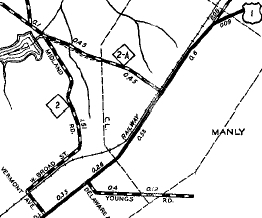 In 1951 or 1952, NC 2 was rerouted on its east end. 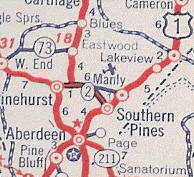 Instead of dipping south to Southern Pines, NC 2 stayed east on Yadkin Rd to end at US 1 May St in Manly (spelled Manley on some early officials). The new ending was a replacement for NC 2-A. 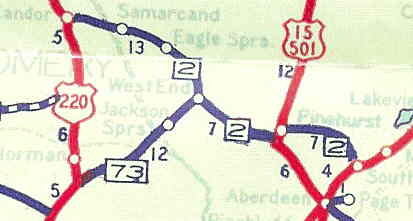 NC 2's original dip to Southern Pines via Midland, Broad and Vermont became part of the NC 22 southern extension (now all secondary). 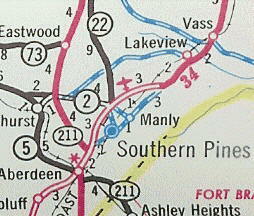 In 1956 or 1957, NC 2 was re-extended west to NC 211 (now NC 5) in Pinehurst. This replaced a rerouted US 15-501 and had also been NC 2's routing when it went to Candor. 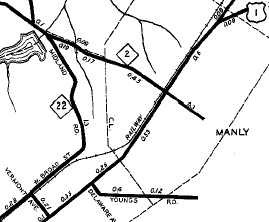 The 1962 Moore County map shows May St as SR 2080, yet both NC 2 and NC 22 continued to run east of the US 1 Bypass. 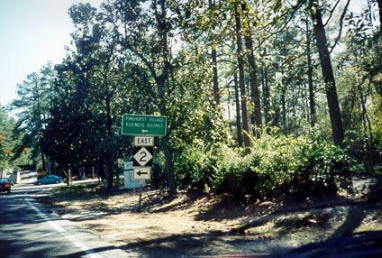 Beginning in 1967 or 1968, NC 2 is shown as truncated to the US 1 bypass of Southern Pines, where it ends today, leaving behind SR 2029 Yadkin Rd. Comment: NC 2's purpose today is to provide a direct route from Southern Pines to Pinehurst. It has a traffic circle at the US 15-501, NC 211 junction and has a really old 4-lane segment that constitutes most of its routing (see the 1941 scan above showing the multilane NC 2). 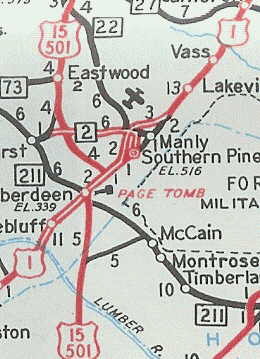 NC 2 once ran more directly in Pinehurst through the central area (shown this way on the 1930 Moore County Map). However, when NC 2 was extended west again it used the multi-turn routing it uses now between NC 5 and the traffic circle.